Just allow me just say that I am looking forward to drier weather and NOT bathing the dogs every time they go out for a romp. I think I will change their name from the "Nanjay Fur Patrol" to the "Nanjay Mud Muffins"! Special congratulations to "Roady" and his family on Roady's recent accomplishments. He completed his Canadian Championship at the Orangeville and District Kennel Club dog show this past month. Roady was entered in shows for two weekends late last fall and he did us all proud by earning nine points and several Best of Breeds. But we need ten points to become a champion, so Roady needed to leave home just one more time, come to Camp Nanjay for the weekend and attend one more show. He continued his winning streak by being awarded Best of Breed both days he competed; thus finishing his championship. Roady was piloted to these wins by William Alexander (and I got in the ring to show Roady as well!). Proud parents, Linda & Ed Ansell are happy to have their boy home, where Roady is always busy assisting his dad with whatever project he is doing, or keeping his mom company at the computer or on the couch. I know that Roady is going to enjoy his time this year as the three of them go on a "Road Trip" in their Winnebago. Have fun! Special thanks to our Easter Bunny-Boy (pictured above) for posing for our Easter photo. Dillon (Ch. 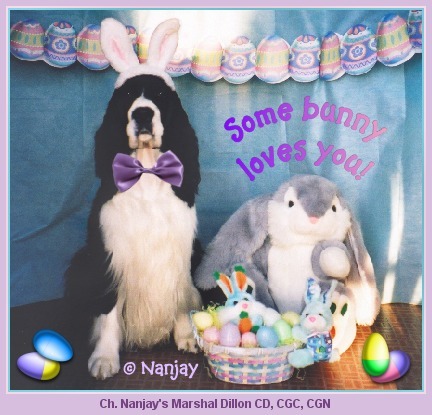 Nanjay's Marshal Dillon CD CGC CGN) looks so cute in his bunny ears, and he is posing beside his most favourite toy in the world ~ his bunny. Dillon (and his brother Nathaniel) have more toys than can be found in some pet stores but Dilly's most beloved friend is the large bunny that was given to him by my son, Corbin. The bunny is new in the above photo (before Dillon made him look just a bit "more loved"). Sincere thanks to our webmistress for making the wonderful Easter Card, starring her boy Dillon. Her other boy Nat didn't want to wear bunny-ears (he kept tilting his head to make the ears fall off! ).